Ice pops shipped to Florida and multiple other states were recalled Monday because of concerns they may be contaminated with listeria. 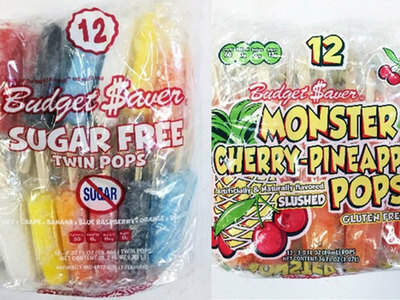 According to the FDA , approximately 3,000 cases of Budget $aver Cherry Pineapple Monster Pops and Sugar Free Twin Pops, produced by the Ziegenfelder Company of Wheeling, W. Va., are part of a voluntary recall. The ice pops were distributed to grocery stores and distributors in the following states: Florida, Alabama, Arkansas, Maine, Missouri, Nebraska, Nevada, New Mexico, New York, Ohio, Oklahoma, Texas, Utah, Washington and Wyoming. The product was delivered from April 5 through April 19, 2018. No illnesses or incidents involving the product have been reported. The frozen products were sold 12 to a package under the brand names Budget $aver Cherry Pineapple Monster Pops and Sugar Free Twin Pops. The Cherry Pineapple Monster Pops carry the UPC code 0-74534-84200-9, and have lot codes D09418A through D10018B. The Sugar Free Pops carry the UPC code 0-74534-75642-9, and have lot codes D09318A through D10018B. The voluntary recall was the result of a routine state inspection of the company’s Denver production facility which found listeria in samples collected by the inspector. The FDA said that Ziegenfelder Company has stopped the production and distribution at the plant as the state of Colorado and the company continue to investigate the problem. Consumers who have purchased the affected ice pops are urged to return them to the place of purchase for a full refund. Contact the company at 1-888-683-0379, Mon-Fri 8 a.m. to 8 p.m. if you have questions.